Nice review, I also use the ernie ball fret wonder wipes, they are great BUT, (you are going to laugh with this one...) BEWARE, DANGER, DANGER!!!! 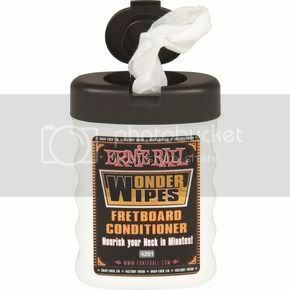 Now what's so dangerous about these fret wipes you guys are asking yourselves... well, not the wipes, THE CONTAINER. So I open the package and I find the neat wipes, I take out the black cover of the container, peel off the protective sealing, take one corner of the first wipe and make it go through the whole in the center of the black plastic cover. Then I carefully put the cover back in it's place, making pressure on top. I proceed to take the wipe, and pull off it's corner, and instead of one, two of them come through the damned hole. It seems they are like toilet paper, they are joined together. Almost 2 whole wipes out of the plastic hole, and I say, "Ok no problem, I'll tear them appart and I'LL PUT THE EXTRA ONE BACK INSIDE THE HOLE". As soon as I pushed the damned wipe back into the container, pushing with my finger through the plastic black hole I realized it was a BIG mistake. The hole was very narrow, made by cutting the thick plastic into little triangles, that pointed to the middle of the damn thing. When I pushed my finger inside the whole, the triangles bent slightly to the inside, with the finger. It was a MORTAL TRAP. My finger got stuck with no remedy. I couldn't do anything because when I pulled back, the damned plastic triangles teared through my finger like sharp knives. I live alone. One of my hands was deep inside a damned ernie ball wipe container, and the plastic was beginning to hurt a lot. No one to help me putting the "plastic knives" away, I finally realized that I could work it out by removing the whole black plastic cover, and with the help of my teeth and my remaining hand, I managed to remove the whole plastic cover. Now I had a nice Plastic-cover-with-soaring-plastic-knives ring in my finger. Luckily the plastic "triangles" where not so hard to slowly be bent from the inside the cover, one by one, I got them one by one away from my skin and bent them hard. 4 Triangles-of-death later, I released myself, washed my hand and discovered I was actualling bleeding at two points!. Bottom Line: Let the damn wipe rot, don't EVER put it back inside with your FINGERS!!!! LOL its the Ernie Ball chinese finger-trap of doom! I hate feeding the wipes through those stupid holes. Some times you pull out more than you want, sometimes you pull and the whole roll pops the top off, some times it snags the wipes and you get that fuzzy stuff stuck on your strings when you wipe them, and apparently they like to eat fingers. Now when I get wipes out I just pop the whole top off and just bypass the hole problem altogether. What a story Fran, you're lucky to be alive! Great review, I might give these a try! i use fastfret as well, it seems like its lasting forever lol, but now the little strings are starting to fall off and leave bits of my strings... i might get some wonder wipes when i am done with this stick of fastfret, good review steiner! Fran, you're quite the writer! No joke, it's been two months since that horrifying experience, and I still can't get near the locket where I keep those evil wipes. I even have nightmares at night; giant wipe containers bite my fingers and ears and tear appart my guitars!